Take me out to the ball game… for the first time! I’ve been to some minor league baseball games in Utah. Lindquist Field hosts the Ogden Raptors and Spring Mobile Ballpark hosts The Salt Lake Bees. The games have been okay, but a little slow. So when I had the chance to attend a Major League Baseball game last week, I took the opportunity, even though I would be sitting by complete strangers. 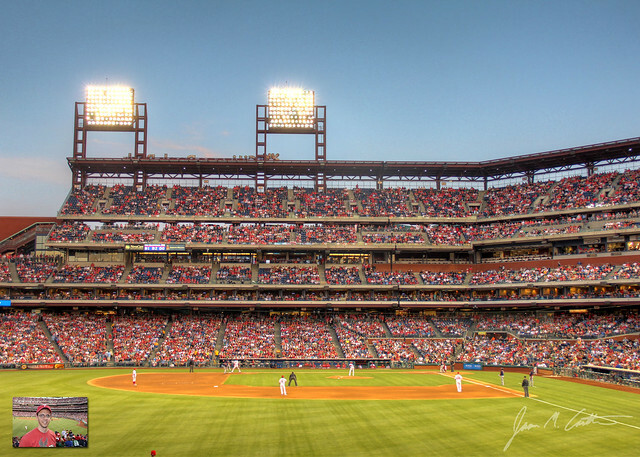 The field: Citizen’s Bank Park. The teams: Phillies v. Red Sox. Start time: 7:05 pm. The photo I shot shows the view I had from my seat. I think it was one of the best spots in the ballpark to sit – great views, lots of activity when the balls hit, and no long stairways to climb. What I will say about the game is that Phillies are major fans of their teams. There was an excitement in the ballpark. There were cheers and boos all around. When the Red Sox hit a homerun, the crowed chanted, “Throw it back. Throw it back. Throw it back!” Needless to say, the guy pocketed it. I guess that means he wasn’t a true Phillies fan! The other thing I found different, and maybe it’s just because I only have minor league games in Utah to compare it too, but drinking seemed like a major part of attending a major league game. I passed my share of beers down the row, then passed the $20 bill to the seller, and the change back to the buyer. Either way, it was a great game and I am very glad I went. I will remember always remember my first-ever Major League Baseball game, and this photo proves it! NOTE: I wanted to whip out the zoom lens and try to grab some great shots of the game in action, but I think there were restrictions on photographing players of the games, and even restrictions on the size of the lenses allowed by patrons of the game. I erred on the side of caution and settled with wider shots. Great shot and great view of the game. Glad you had a great time. Glad to see the recommendation of sitting in the outfield was a good one for you! Thanks. Seats in left field were a great recommendation. Bet you can’t wait for your Yankees v. Mets game next month!